« New Giveaway: Win a Copy of Mark Sutton’s ‘Heart Healthy Pizza Cookbook: Over 100 Plant-Based Recipes for the Most Nutritious Pizza in the World’, Autographed by the Author! This easy vegan taco salad has been our go-to recipe for nights when we want something healthy yet still loaded with tons of delicious Tex-Mex flavors. The past few weeks have been a whirlwind over here! Since I started my new job, there hasn’t been enough hours in a day, it seems, to do everything I need to do. I used to be able to put a nice, freshly cooked meal on the table every night, but now I’m scrambling to find time even to sit down on our couch for five minutes! The whole time management issue has been a challenge, especially since I still very much want to keep this blog going, and exercise regularly. When free time becomes a luxury, you’ve got to get inventive. That’s exactly what I’ve been doing when I make this chili taco salad, and my family always raves about it! A little backstory: Rob and I agreed that if we wanted to have homemade dinners every day throughout the week, I would have to spend a good portion of our Sundays cooking a few meals for the week, and then just reheating some of that food in the evening and making a quick salad or a side of vegetables. The premade foods are also great to pack for lunch at work – they help us save money on eating out every day, plus our homemade food is usually healthier than what we could find during our lunch hour. We’ve done this for a few weeks so far, and while we’re still trying to perfect our system, it’s already paying off by saving us money and time every day on making/buying lunches and dinners. However, when no leftovers are available, these vegan office lunch ideas always come in handy! Anyway, on Sunday I made a pot of my high protein vegan chili with sweet potatoes and TVP, and we packed it for lunch a couple days during the week. This left us with about one bowlful of chili left for dinner by the mid-week. In order to stretch it a little further and make a meal big enough for the two of us, I threw together this taco salad. Rob must have said that it was delicious at least four or five times! Here’s what inspired me to add my leftover chili to a salad. When I first came to the United States, I had a number of odd jobs that most immigrants go through in their first years in this country. One of those jobs was at Wendy’s, the fast food chain where I must have made a million burgers and sandwiches during my days there. I wasn’t vegan back then, and as much as I tried to eat as healthy as I could (at least I thought so), I indulged in some of Wendy’s food every now and then. One of my favorite things there was the taco salad, which consisted of a mixture of lettuce, tomatoes and cheddar cheese topped with a ladleful of beef chili, crispy tortilla strips, and Southwest dressing. Fast forward to today – lettuce and chili (vegan, of course) still sound good together to me, but cheese and overly processed tortilla strips and dressing are long gone. 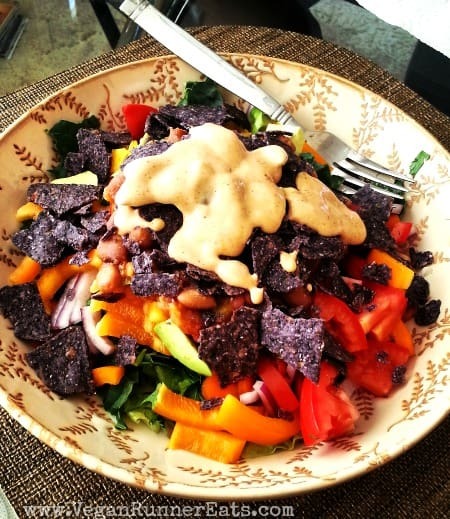 And yet my vegan taco salad is just as delicious and filling, and a whole lot healthier! To further cut down on processed components, read the label on the tortilla chips you’re using here – the brand I used had organic blue corn, and only four or five ingredients. For a healthier mayo option, use homemade mayo, like this recipe from Fat Free Vegan, instead of store-bought vegan mayo. The conclusion: with some planning ahead, it’s possible to enjoy homemade plant-based meals every day during a busy week, and even reinvent the leftovers and make them into new meals! A delicious, healthy and filling salad that combines the crunchy texture of vegetables with a creamy flavor of chipotle dressing. 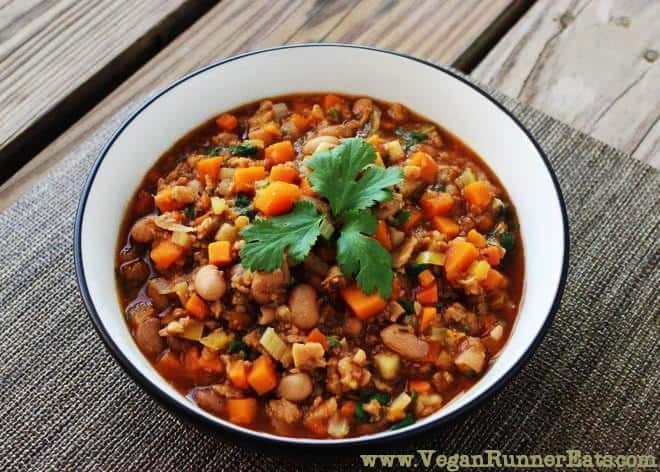 I made it with my Sweet Potato TVP Chili, but you can use the leftovers of any vegan chili you might have on hand. 2 cups chopped vegetables of choice: bell peppers, red onions, tomatoes, avocado, etc. 2-3 Tbsp chopped herbs: cilantro, parsley, chives, scallions, etc. Arrange rinsed and chopped salad greens between two large bowls. Top them with equally split amounts of chopped vegetables and herbs. Heat up the Sweet Potato and TVP Chili. Once it’s warm, ladle the chili on top of the veggies. Sprinkle with crushed tortilla chips and top with the dressing. Toss all of the ingredients together before digging in. Combine all of the dressing ingredients in a small bowl, whisk with a fork until smooth. Use to top the taco salad, or as an aioli on Southwestern-inspired vegan burgers. Any other vegan chili or a can of rinsed black beans can be used instead. Question: How do you get creative making meals after a long day at work? Do you ever create new meals using leftovers? Please share your thoughts and tips! Tagged cooking tips, easy recipes, plant based diet, salads, soups and stews. Bookmark the permalink.